This pressure cooker recipe for Chinese Sticky Rice with Sausage recreates the classic dim sim Lo Mai Gai in one step, using your Instant Pot. I definitely made some simplifications. I didn’t use lotus leaves because they’re not that easy to get a hold of, and I wanted a dish we could all make on a weeknight. Also, somehow I am always out of chicken when I start craving this dish. The one thing that does require a little planning, is buying the Chinese sausage or Lap Xuong or Lap Cheong ahead of time. I debated whether I should try this with widely-available sausage, but really, there is nothing like that Chinese Sausage, no real equivalent. So I decided to stick with that one speciality ingredient as it is well-worth it. Lap Xuong is a pork sausage where the pork has been marinated and then smoked. The end result is a slightly sweet and salty sausage that adds a lot of flavor to this very simple dish. Other than that however, the only thing that I had to ensure that I had were dried Shitake mushrooms, and really you could use fresh ones, or you could use a different dried mushroom. The first time I made this, I used porcini mushrooms. ENTIRELY not Chinese, but I can’t say that I thought it was a problem–to be honest, it tasted quite good to me. 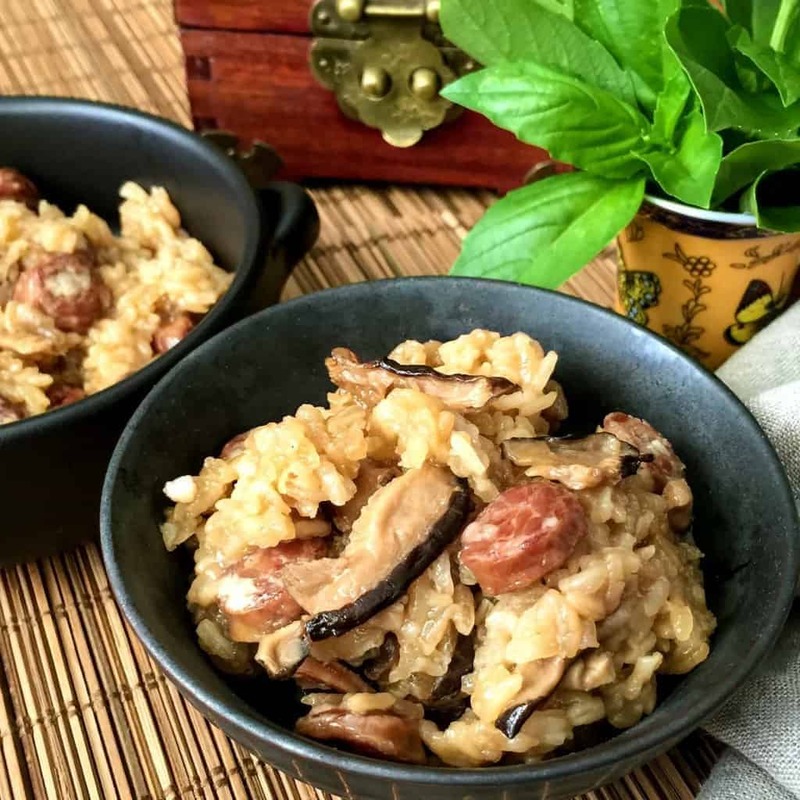 If you do end up buying dried mushrooms, I have several recipes where they might come in handy, such as the Pressure Cooker Low Carb Hot and Sour Soup or in the Shrimp Risotto. If you have other uses for them, do leave a comment so people can use other ideas. I hate recommending an ingredient for just one recipe–it’s far too expensive to cook like that, so I’m always careful to not create just one recipe with one ingredient. 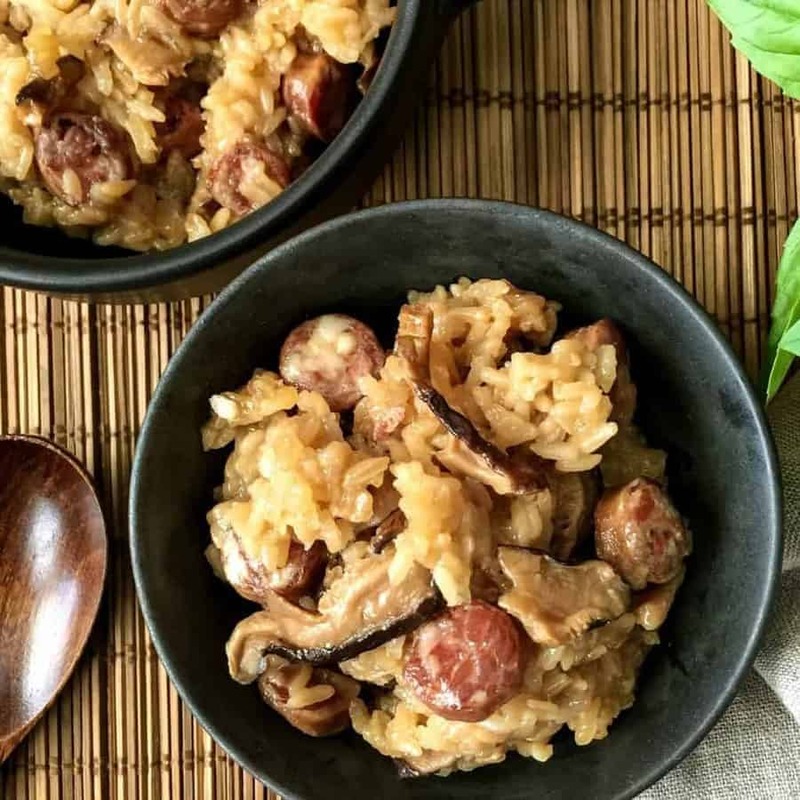 This pressure cooker recipe for Chinese Sticky Rice with Sausage recreates the a simpler version of the dim sum favorite Lo Mai Gai in one step, using your Instant Pot. So nice to be able to make this at home for a weeknight supper! Soak the dried mushrooms in hot water and let them sit there while you get your other ingredients ready. In the inner liner of your pressure cooker or instant pot, add in all the other ingredients. Add in mushrooms and stir. Cook on high pressure for 10 minutes, and then allow it to release pressure naturally for 10 minutes. Then release all remaining pressure. Open the pressure cooker, stir to mix well and allow all water to absorb, and serve. NUTRITIONAL INFO DOES NOT INCLUDE CHINESE SAUSAGE. I am unable to find reliable information for it, my apologies. I made this recipe and liked it alot. I would use 2 sausages instead of 3 because the sausages have a good amount of fat and I found the dish too greasy, but I love the taste of the sausage. To make the dish taste more authentic, I lined the instant pot with banana leaves and it tasted just like dim sum sticky rice. It was a big hit at my house. I’ve made this a couple of times and I’m about to make it again. This has long been my favorite dim sum dish, and it comes out pretty amazing with this recipe! I always add boneless dark meat chicken marinated much like you suggest, and it’s sublime. This time I’m trying it a little different, adding garlic, ginger, and some chili paste. I live in the DFW area, and I’ve had a really frustrating time trying to find lotus leaves. The Asian supermarkets in Carrolton (Super H Mart and 99 Ranch, where I get the Chinese sausage) don’t have them, and I’m at a loss of where else to turn. They aren’t essential, but the scent they add is a very nice touch. How many cups of water when you use 4 cups of rice? I made this last time using the adjusted amount above but it came out too mushy because too much water. This was so delicious! How would I adjust the cooking time if I want to cook 2 cups of rice? What if you want to make more than 1 cup rice? Do you cook longer? And is the brown sweet rice the same as your brown glutinous rice? We loved this. We love Asian food and happen to have markets and such local. This can out perfect. My Asian market only had whole dried shiitake mushrooms. I soaked them, cut them and soaked once more. I squeezed three quarters of the water out of them before adding to the pot. Used a little more than half teaspoon kosher salt and it was perfect. Next time I’m adding chestnuts and lotus leaves to the top.